Our pure Oxygenation System pumps pure oxygen into your cooled wort using a disposable oxygen tank and stainless steel diffusion stone. Takes around 1-2 minutes of operation to achieve adequate oxygen levels, depending on the starting gravity of the wort. 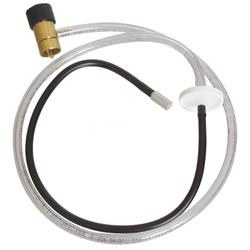 Comes with a regulator, our .5 micron stainless steel oxygenation stone and tubing. Disposable Oxygen tanks are available. Each disposable oxygen tank will last for approximately 10-15 five gallon batches. Stainless Steel In-line Oxygenation Assembly (No Barbs) - This is a product that many professional breweries use in their pilot systems. It is easy to use and easy to clean. Needs an additional source of oxygen (not included). This completely stainless, inline oxygenation system injects oxygen into your wort as it travels from your wort chiller to fermentor and allows you to read the temperature coming out of your wort chiller at the same time. It has a 2" stainless thermometer and a 2 micron diffusion stone. 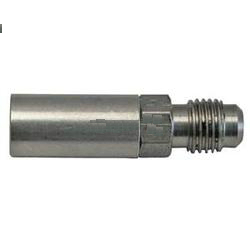 The oxygen inlet barb is 3/8".